This time last year we’d only been at Roden House for 8 months and we’re settling in to life there, I did a review of 2011 which you can read here. We’d just purchased our Myford Super Seven metalworking lathe in December 2011 and that was a major step for the Hackspace and led to much more quality based approach to tool acquisition in 2012 a year that saw Nottingham Hackspace able to meet it’s full rental costs from membership payments alone and breaking the 100 members mark too. 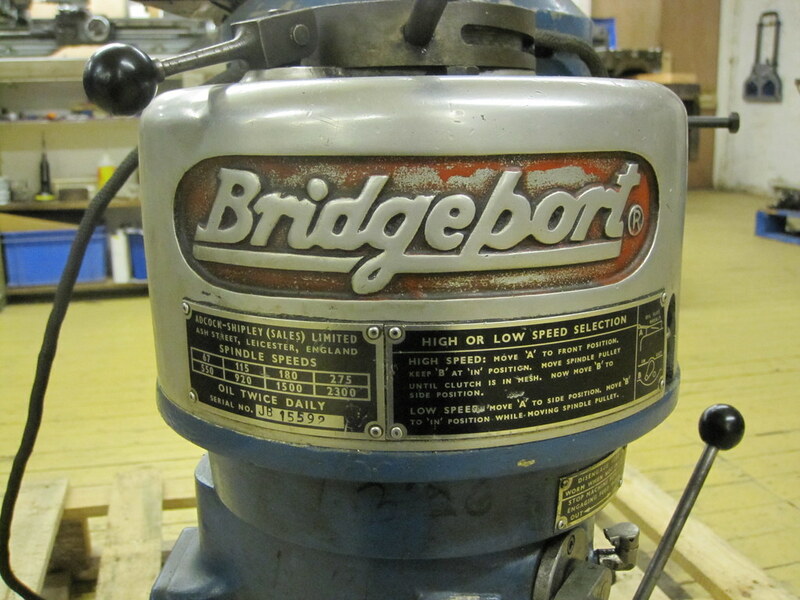 Co-incidentally Nottingham Hackspace has acquired a superb Bridgeport milling machine by Adcock-Shipley of Leicester made in about 1974. We had a tip off from a member of Bristol Hackspace about it’s possible availability at a bargain price. Founder Member Matt Lloyd (aka RepRap Matt and @DPSLWK on twitter) is working carefully through the required restoration to get the mill in top condition for the future. Matt says at this time there are no plans to add CNC to the mill and should be ready to use in the next few months. 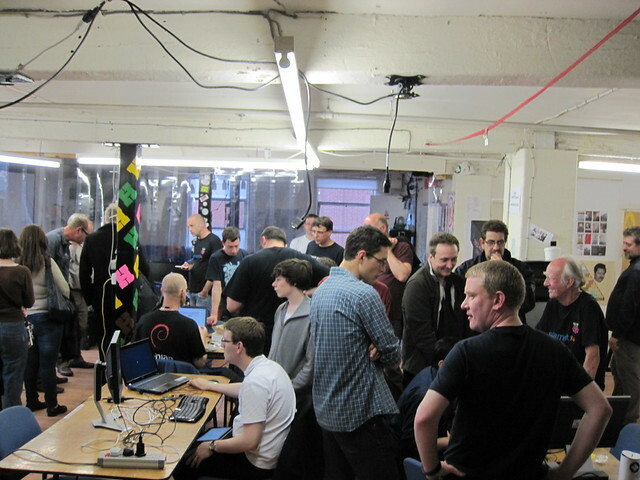 One of the first major events last year was the Global Gamejam 2012 and Nottingham Hackspace hosted teams and you can find a write up of that event here. In March we attended the Science in the Park event at Wollaton Hall teaching well over a 100 kids and adults how to solder. We’ll likely be attending that event again in 2013 on the 23rd March more information here. April saw us run workshops in making rubber stamps on the laser cutter and making a bat listener. We also had a day dedicated to learning CNC techniques. 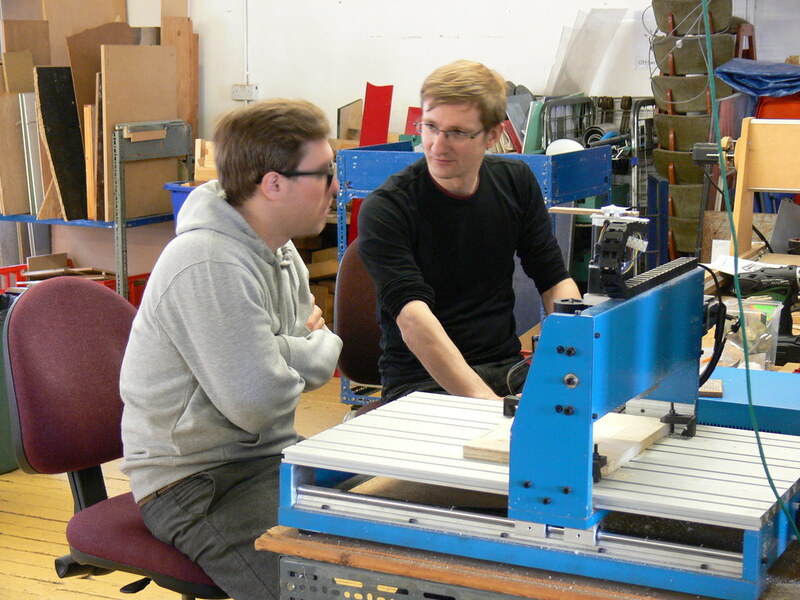 The CNC day was run by David Hayward, Matt Little and long time friend of Hackspace Andy Harsley. 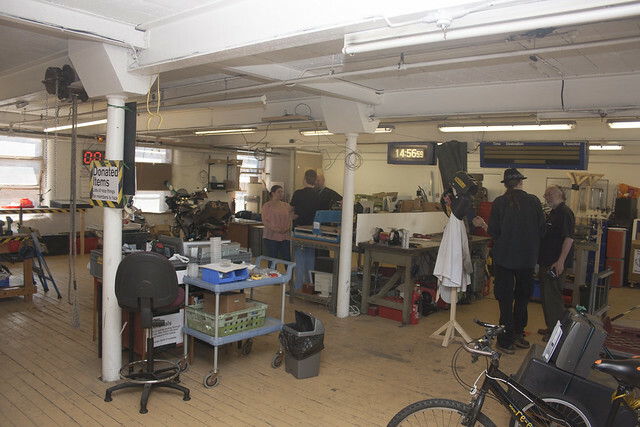 Just like the event in 2011, Open Day is a chance for us to show off projects and tools and invite anyone who is interested to visit the space being shown at it’s best. June saw Nottingham Hackspace attending the local Mini Maker Faire at the Silk Mill in Derby just up the road from us. The Faire was well attended and Nottinghack showed off it’s automated lighting system plans. 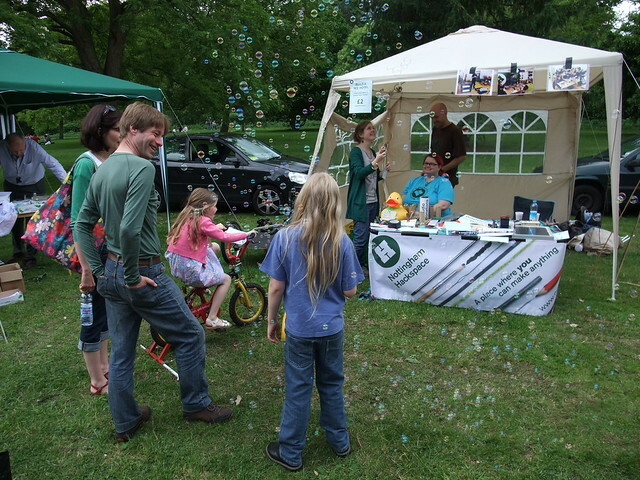 In June we also attended the Green Festival in Nottingham’s arboretum. In July we had a number of workshops including solar power and a Ladies Night organised by Kate Bolin. We also had one of the most successful events of the year in July the Raspberry Jam, which is an event for users of the Raspberry Pi micro computer. 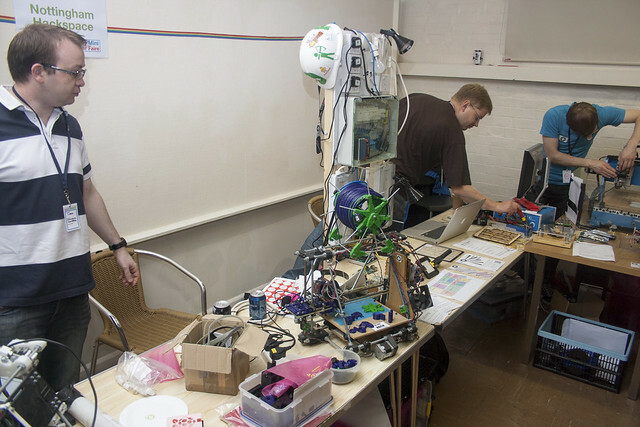 August saw the Nottingham Hackspace acting as venue to the Young Rewired State Nottingham team who won “Best Example of Code” resulting in the prize of a Google Plaque (displayed in the comfy area) and a RepRap kit witch they are building most Sundays at the Hacskspace. We had quite a few activities at the Hackspace in September too including wine making, lock picking and candle making. October saw Nottinghack attending the Ignite Futures Pop-Up Science Shop at the Broadmarsh centre in Nottingham. The shop called 3-2-1 Ignition was very successful. 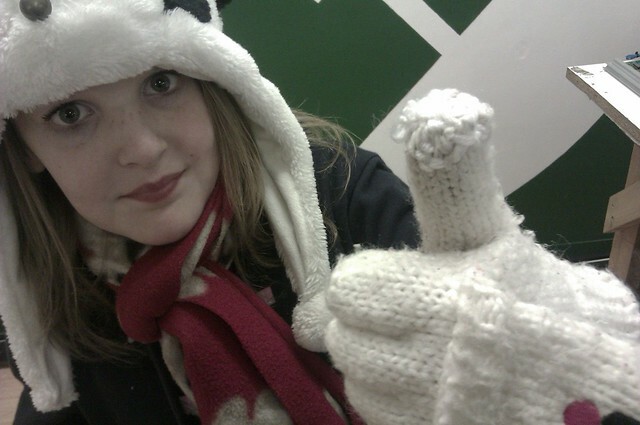 Hackspace had a take over day. 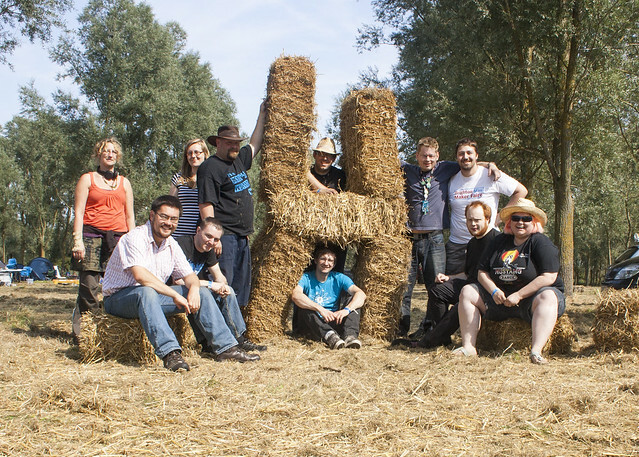 It’s been a great year at Hackspace and a real one for growth in both membership and stability. I look forward to another year of surprises.